Between April 1918 and May 1919 influenza, or its secondary complications, caused up to 50 million deaths, far more than had been killed in four years of war. Many died within the first few days of infection, and nearly half of these were young, healthy adults. The speed with which it spread has been described as 'Perhaps the most extraordinary feature of this extraordinary pandemic...' for the easy transfer from shore to ship and ship to shore, meant that even communities isolated by sea were vulnerable. A rigorous maritime quarantine policy reduced the immediate impact in Australia, but by the end of 1919 the nation had still suffered more than 11,500 deaths. Even today the speed of Encounter's response must be admired. Her sailing orders were telegraphed from Melbourne on Friday 22 November, and throughout the next day and night the cruiser's ship's company worked tirelessly to get in relief stores. Without any information from Samoa as to specific requirements, Thring loaded almost 150 tons of cargo ranging from blankets and tents through to drugs and dry provisions, expecting that these would meet any emergency. The weekend created further difficulties as shops were shut and some items not in stock had to be purchased. Nevertheless, on Sunday forenoon the medical teams embarked, the last of the stores were in by 15:50, and ten minutes later Encounter sailed from Sydney. Arriving in Suva on 30 November Encounter took on half the available coal and, 'almost more important', 39 tons of water. With influenza still prevalent, Thring implemented a strict quarantine enforced by guards placed on the wharf. The ship's company completed all coaling, rather than the native labour normally employed. As no one could return from ashore Thring communicated by letter with Britain's resident High Commissioner for the Western Pacific, CH Rodwell. The news was not good. The Samoan epidemic showed no sign of abating, with deaths in Apia reaching 50 a day. Moreover, a message from Tonga indicated that conditions there were at least as bad while the facilities for coping with it were worse. On his own initiative, Thring extended Encounter's mission to include Tonga, but to avoid further delay, landed a nine man team under the senior Army surgeon, Major Alexander, to take immediate passage in SY Ranadi. Unfortunately, the yacht broke down soon after sailing and was forced to return to Suva. 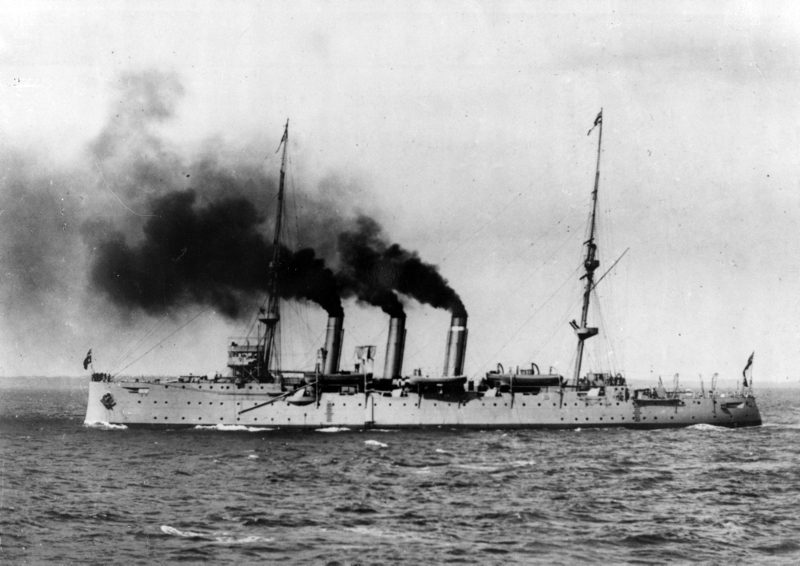 Sailing from Suva on the evening of 30 November, Thring called for 80 volunteers from his own ship's company should it prove necessary to provide greater assistance ashore. Despite the dangerous and unpleasant nature of the work, and the fact that any party landed would be left behind - missing their first peacetime Christmas at home - all the officers and most of the ratings volunteered. It would be difficult to find a more telling example of the Australian Navy's tradition of 'service before self'. Encounter anchored off Apia on the morning of 3 December. The harbour was small for a ship of her size and, when combined with a considerable swell and strong winds, made unloading extremely hazardous. Although the ship rolled through more than 20 degrees, within six hours the landing party (6 surgeons, 18 medical orderlies and 3 naval sick berth ratings) and their stores were safely disembarked. Ashore Surgeon Grey and his teams immediately set to work, yet the scale of the disaster remained daunting, and for many of those afflicted help came too late. A Sydney newspaper reported that the Australians 'with their motor trucks are doing wonderful service day after day gathering up the dead, who are simply lifted out of their houses as they lie on their sleeping-mats. The mats are wrapped around them, and they are deposited in one great pit'. Made worse by the deaths caused by exhaustion and starvation, the two month epidemic eventually killed 25 per cent of the total Samoan population, and often more than half the male adults in individual communities. Economic and social collapse followed. Thring landed his last surgeon together with five orderlies and the remaining drugs and stores, but there was little more he could do. Yet even this small contribution was of great relief to the European and indigenous community. In thanking Thring for Encounter's 'timely aid', the Consul remarked: 'Though conditions had greatly improved before the party arrived there was still a good deal of work to be done of a nature that required professional skill and knowledge'. The party, he added, 'has been indefatigable...in efforts to eradicate the disease'. Thus ended Australia's first overseas relief expedition. One which, although unusual for the times, foreshadowed the now regular employment of the RAN's assets to provide humanitarian assistance and demonstrate national interest in regional affairs. Indeed, in the context of the maritime doctrinal concepts of flexibility and adaptability, it should be noted that Thring's orders were not restricted to providing medical aid. Preserving order in the Pacific was among the many subsidiary duties undertaken by the early RAN, and warnings of trouble brewing among the inhabitants of the Gilbert and Ellice Islands (now Kiribati and Tuvalu) had been received by the Naval Board in the weeks before the expedition. While in Suva, Thring took care to discuss with Rodwell how best a warship might support his authority. On this occasion no immediate assistance was necessary, but Encounter's mission might easily have been extended to provide presence elsewhere, and back this up with a large landing force if necessary. It remains a poignant reminder that by their nature, seaborne forces possess a variety of characteristics and attributes which are not necessarily present in other tools of government foreign policy. ↑ A Butler, 'Official History of the Medical Services 1914-18, Vol. III, Problems and Services', Australian War Memorial, Canberra, 1943, p. 191. ↑ Butler, 'Problems and Services', pp. 394-5. ↑ 'Sailing Orders', HMAS Encounter file, SPC-A. ↑ 'Report of Cruise to render assistance in the influenza outbreak', 14 December 1918, HMAS Encounter file, SPC-A. ↑ Sydney Daily Telegraph, cited in Dr Seini Kupu, 'Pacific Public Health Surveillance Network Influenza Guidelines', Secretariat of the Pacific Community, 2005, p. 37. ↑ HJ Hiery, 'The Neglected War', University of Hawaii, 1995, pp. 172-5. ↑ Letter, British Agent and Consul Tonga to Thring, 12 December 1918, HMAS Encounter file, SPC-A.